As avian flu breaks out again in Britain, More or Less visited the scientists who advise the government on the risk of the disease spreading due to the migration of wild birds. 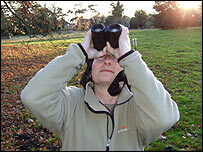 The British Trust for Ornithology is in charge of counting and tracking birds in Britain and Ireland. Our reporter Ruth Alexander found out how they do this, and how the data they collect can be used to indicate whether wild birds could have brought the disease into the country and, if so, where they might be heading next. "By 2008, no one will have to wait longer than 18 weeks from GP referral to hospital treatment." This commitment did not just mean dramatically cutting average waiting times for treatment. The NHS has also had to change the way it measures waiting times and - as 2008 approaches - the new, more useful way of measuring how long people wait for treatment has revealed just how difficult the pledge will be to fulfil. A few weeks ago several newspapers published reports claiming that the worst problems of excessive drinking in Britain could be found in middle class enclaves such as Guildford and Harrogate. We revealed how that was not the case. But statistical myths have a habit of spreading and we felt we had to correct this one when it cropped up again during an interview on Tuesday's Radio 4's Today programme. In the past we revealed how poor statistical analysis meant that it was not possible to say whether speed cameras reduced accidents and, if so, by how much. The official figures did not take into account "regression to the mean". However now the numbers have been crunched properly. The new figures reveal that speed cameras probably do reduce accidents - but not as dramatically as previously claimed. We thought the debate was settled. So why is it still rumbling on? BBC Radio 4's More or Less was broadcast on Monday, 19 November, 2007 at 1630 GMT.